Quite frequently the topic of commuting arises in office conversation. Everyone commutes, and so it’s something that coworkers can commiserate about when the weather isn’t particularly cooperative. Most people view their commute as a necessary evil or at the very least as a time to just zone out, but I don’t feel this way at all. 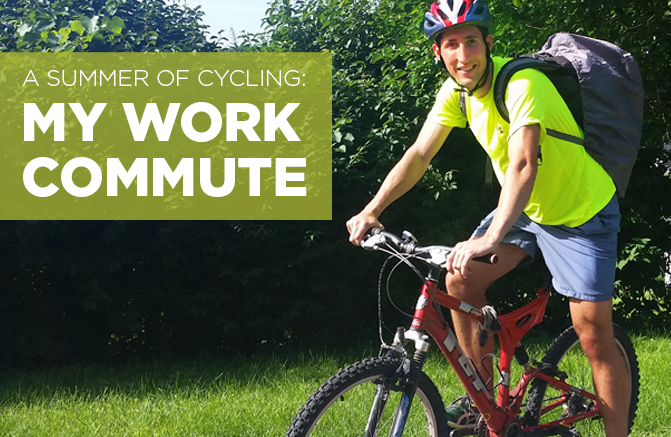 I biked to work each day, and it was one of my favorite parts of the day! Now biking to work is not for everyone, but it was definitely for me – at least in the summer, that is. One of the best feelings was traveling down the bike trail and flying past all of the traffic which was crawling along on the interstate, while on the other side, the Monongahela River wound its way around Pittsburgh to merge with the Allegheny. When I found out that I would be working for UPMC as a Summer Associate, I immediately began to think about where I should live for the summer. Driving in traffic and waiting for the bus are two particularly unfavorable activities in my opinion, so I decided to choose an apartment based on its proximity to a bike trail which I could take to work. After some Craigslist hunting, I found a great location. Located half a mile from the Eliza Furnace bike trail, I was sold! This trail cuts along the river for four miles and connects Greenfield to Grant Street, and therefore to the U.S. Steel Tower. My everyday commuting routine began with carrying my bike downstairs from my second story apartment. Because I wanted to keep my bike safe and dry, I had to carry it up and down the tightly enclosed staircase every day, which was about as hard as it sounds. After this difficult test of dexterity, I was able to zip down Greenfield “mountain” at about 30 mph, another one of my favorite parts of the commute. Then came about three miles of flat biking, which is where the bike trail hugs the river’s edge. Upon arriving at Grant Street, I would need to slow down and walk my bike up to the bike racks provided at the U.S. Steel Tower. Now the number one question I was asked about biking to work is: “Do you bike in your suit?” My answer is a definitive “No.” The hardest part about the entire commute was what to do with my suit. My solution was less than ideal, but it worked. I folded my suit in my backpack and carried it with me to work, and then upon arriving at Steel Tower changed into my suit in the basement YMCA. The answer to how I folded up a suit in a backpack is that I did it very carefully! The entire bike commute took only 20 minutes, saved over $5 a day, and allowed me to get at least 40 minutes of exercise. When it rained, I did get wet. But so long as I had my pack cover on, my suit stayed dry in the backpack. It was as easy as that. I would highly recommend biking to work to anyone who is looking to get a little more exercise or save some money. Saving a minimum of $5 a day may not sound like much, but over the summer it has added up to over $300. I encourage anyone thinking about biking to work but who hasn’t taken the plunge to just give it a try! It could be fun!